What began as a slow and cold (le Carré-esque) waiting game grew into a white hot flash of deceit, anxiety, and dangerous thrills. I cannot claim to know the full horrors and trials of World War II- nor can I draw a true comparison between that dark time and the present, but the world of this book is a different world from our current version. One constant remains: the truth is subjective. In 1940 a young woman is recruited into the fold of MI5. Europe is falling, Britain is in peril, and…notes need typing. I found myself wrapped up in the disappointment of being “someone’s girl”, but I was quick to change my tune as taking notes and fixing tea evolved into slipping between the worlds of high society, home-grown fascists, and the interior war of attraction versus companionship. This is a story of capability; what one is born with, what one aspires to be, and what is thrust upon a person by both circumstances both stifling and extraordinary. 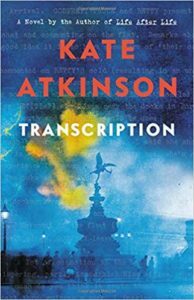 I have been an avid Kate Atkinson follower for some time now; I do miss the older oddities of Human Croquet and Case Histories, but having been originally brought into the fold by Life After Life I am content to carry on with Atkinson while she continues to reopen the wounds of the world wars. Share the post "an exercise in lying to liars"